​Cheap knives cause an allergic reaction to cooking. Without the right tools for the job, mastering delicious meals loses its edge (sorry) and feels like a chore. And those $15 grocery store blades you have in your drawer surely aren't going to cut it (again, sorry). So what are the right ones? 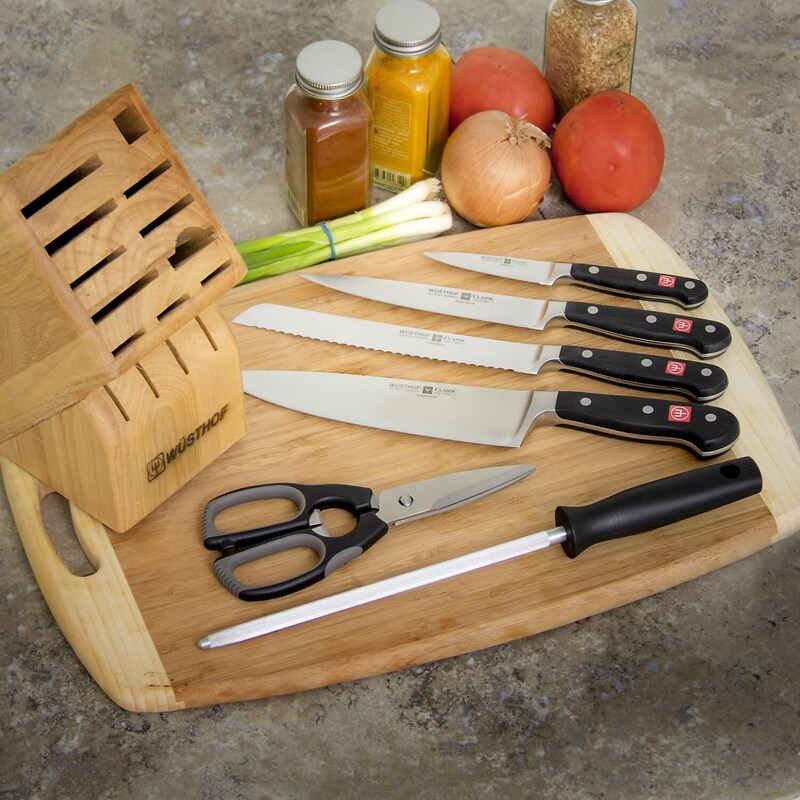 After testing out the CLASSIC 7-Piece Mobile Block Set series—knives that have topped the charts of the Sweethome and Consumer Reports testing—it’s clear these blades will help you develop (or rediscover!) your love of cooking. They'll also probably be the last knives you'll ever buy. Hey, there’s a reason why chefs protect and carry their knife roll wherever they go—dependable knives are everything. Unlike cheaper knives that use a fabrication process to stamp out steel or weld different pieces together, Wüsthof's Classic series are forged from a single piece of tempered high-carbon steel. In the hand, this feels noticeably different—it's much heavier, sharper, and results in the knife doing the cutting instead of your arm. Since the forged piece of steel runs the entire length of the blade—known as a full tang—the knife also possesses a balance that allows for improved precision. Wüsthof has kept its iconic triple rivet, connecting the handle to tang, which retains the classic look of home kitchen knives. If you're not used to using quality knives, it's likely you've never bothered sharpening or honing them before. You probably shouldn't sharpen a knife yourself, and since you only really need to do so every year, it's worth paying for a pro to do it. You should, however, hone your knives using a honing steel. Doing a quick touch up will straighten out your blade and keep the edge sharp. It's also important to wash and dry them by hand immediately after use—never put them in the dishwasher. Of course, if you were to somehow lose that edge forever, Wüsthof has a lifetime warranty. The obvious downside of pricey knives is, well, the price. (One basic knife is normally around $100.) There's no getting around the fact that good knives are expensive. If you don't have the budget for a set, getting a chef's knife (or a "cook's knife" as Wüsthof calls it) will be a huge improvement. They often come with a paring knife for the same price. But if they help you cook more, good knives will probably save you money in the long run. They'll also help you eat better. When I brought our test set—the CLASSIC 7-Piece Mobile Block Set—home to my apartment, the big question was how long would it take for someone to cut themselves. Obviously, the prospect of a huge jump in knife quality bred a certain enthusiasm that anyone would describe as dangerous. And knives do not come with the chain-mail glove that they should. Within two days, they drew blood. When you have knives that are that sharp, you don't always realize you've been cut until there is blood. Everywhere. Still, much better than crap knives. Ethan Wolff-Mann is an editor at Supercompressor. He has a few scars. But that's okay, because "scar" and "story" probably translate to the same word in some languages. Follow him on Instagram.